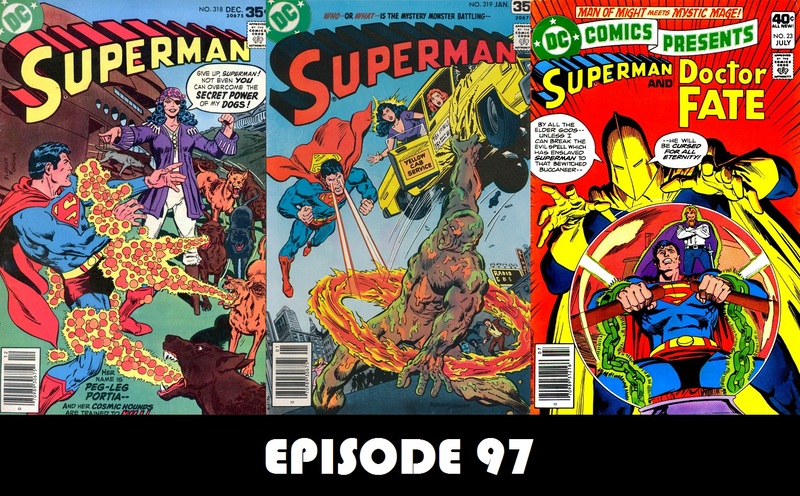 The time has finally come for Episode 97 of Superman in the Bronze Age! This time out, Superman meets a space pirate and her dogs, the Solomon Grundy of Earth-1 makes his debut, and Dave Weter presents DC Comics Presents #23, in which Doctor Fate helps Superman. Hi Charlie & Dave. (since you told me I could call him that) Thanks for answering my questions last episode. I was hoping I could answer yours’ too about Superman and Aquaterra, but I couldn’t find anything. I even looked for it with Superboy, but no soap. Guess Superman doesn’t know what he’s talking about. Great synopsis by you on issues #318 and #319. I had forgotten that I did actually have those 2 comics, and I also have the 2 you will be talking about today. Then my collection skips to #326. This is a stupid question because I should know the answer. Where did that sound clip of “Solomon Grundy wants pants too!” come from? I know I’ve heard it and Michael Bailey says it all the time, but I just can’t place it. Tell David that I am thoroughly enjoying his segment. I do miss the talk about Superboy, but DC Comics Presents… was always one of my favorite comics. It’s another comic title I’m trying to get a full run of. (only 20 more issues to go) You both do such a great job. Hope this episode finds you healthy and happy. Thanks to you both for keeping me entertained at work!